I don't scrap with pink very often. Almost never, in fact. I do make some pink cards or gift bags once in a while, but even that is rare. Last May I became a godmother to two girls. It took me a long time to scrap the pictures because I wasn't sure what direction I wanted to go with the layout. With hundreds of photos of the day, there were so many choices to make. Should I focus on their baptism, or on my becoming a godmother? Should I scrap their mom's baptism too, or just that of my godchildren? Should I journal about Trevor so desperately wanting to be a part of the baptismal ceremony, or should I keep the focus on me and the girls? Candid photos or posed? A separate layout about each girl, or one that includes them both? I decided to make a one page layout about how honored I was to become a godmother. I'd mix candids with posed photos. I'd include one picture of Trevor, but wouldn't mention him in the journaling. Once I made the decision of what direction my layout would go, I struggled to decide what colors to use. The girls were both in white dresses; I wore turquoise. After going through just about every piece of patterned paper I own, I settled on a beautiful pink polka dot by Melissa Frances. It is young and feminine and joyful, perfect for my layout about the two little girls who became my godchildren on May 22, 2011. I used gold accents, and kept them small and delicate. What fun to work with a completely different color palette once in awhile! "Mommy, THIS is the project we will be doing tomorrow," said Trevor at bedtime, handing me a sketch. "We need blue, green, brown, grey and colorful paper, plus scissors, and I will tell you what to do. You may have some of your own ideas, but on some parts you need to do what I say." 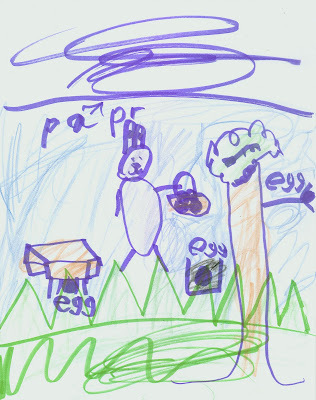 The sketch shows that we'd be using "papr" to cut out an Easter bunny, tree, and eggs, which would hide under a table, in the tree, and in some sort of can. The most recent Trevor-directed projects (our Angry Birds poster and this Snowman craft) were a great success, so I was looking forward to this. The next day, after school, lunch, homework and chores, it was finally time for the project. Trevor put on his bunny ears and got to work. I waited for my instructions. He explained that we needed to make grass from the green paper by cutting out triangles. Then we were supposed to make a brown tree trunk and green leaves. Next, we cut out a gray bunny. He was very particular about the way the bunny looked. He inspected my cut-out, then had me redo the arms to his satisfaction. Trevor's original plan was to cut out baskets, but he was tired at this point. He ended up drawing his baskets and other details. Finally, we cut eggs and hid them all around the drawing. He was very happy with how his turned out. Here's a closer look at Trevor's artwork. And here is mine. It was a lot of fun to make. For you parents out there: Do your kids ever teach you how to do craft projects, the way Trevor teaches me? I don't remember sitting my parents down when I was a kid and carefully explaining how to do a project I'd dreamed up. Maybe I did and just don't remember. Although I do remember making the neighborhood kids follow my instructions on how to make projects, now that I think about it! Over the years, I have amassed quite a few punches. Not so many that I forget what I have, but it's getting close. I decided it was time to create an organizer. I started by dividing all my punches into two piles: border punches in one pile and everything else in the other. I got out a scrap of black cardstock and punched a sample from every border punch. I used white cardstock to create a card for each punch, then attached each sample to one and wrote the name above it. I used my Crop-a-dile to punch a hole in the corner of each card. I added a ring, then tied an orange ribbon to the ring, indicating that every punch on the ring is Fiskars brand. If I happened to own any other brand of border punches (which I don't), I would have made a separate ring for each brand and added an appropriate ribbon. I did the same thing for my miscellaneous punches. I have two rings of those, one for my Fiskars punches (in the picture below), another for the rest (mostly Marvy Uchida). I love my new organizers! 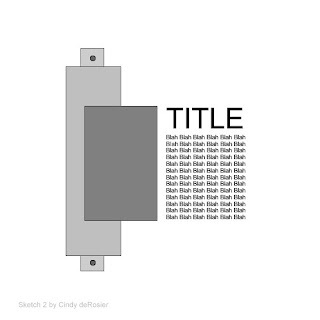 It's great to have a visual reminder of what I own, plus I love having the names of the punches all in one place.